I am always continually amazed at some of the things people say. If you think some of the things I say are crazy, you have no idea. I don’t run around telling people their outfits look weird or tacky even if I think so, I don’t say cruel or outlandish things (usually), especially not to strangers (who don’t deserve it). For some reason, I’ve found that people tend to lose their decency filter when it comes to tattoos. Love them or hate them, tattoos are, well, everywhere. If you don’t have one and don’t want one, I respect that. They’re expensive, scary, intimidating and yeah, unnecessary. No one needs a tattoo, of course. And if you hate them, I respect that, too. Frankly, I hate piercings. I just don’t bring it up to people who like them or have them, and I’m pretty sure y’all are cool cats and don’t do the same thing to people who love or have ink or studs in their face. And anyway, most of the time, people will ask me about my cupcake tattoo and why I have it, or tell me they like it, or say it’s cute, and that’s that. And I think it’s awesome that people like it since I love it, too. I also think it’s awesome that I can show it off at work since I used to work at other places who were so stuffy about them. I’ll have you know I worked at a frozen yogurt shop that blasted pop songs from the early 2000’s and called their employees “spoonologists.” I’m pretty sure having a tattoo wouldn’t destroy the uber-serious, conservative image they were obviously going for. Anywho, one day I was at my current job, minding my own business and busily taking and running orders to customers. We were settling down in the day and I was delivering sandwiches to a couple who were waiting outside (and for the record, had the most complicated sandwich order ever) and I tried not to judge them for that when they were ordering and making me partially homicidal. And then picked up her mayo-laden sandwich and shoved it into her wrinkly, fat face. I stood there for a brief moment, deciding if I should get all violent on her and smack her senseless with a sandwich basket, but I didn’t want to clean up blood and also, there was a toothless man approaching the door and I wouldn’t want a witness, so I just cleared my throat and said, “well, I use SPF every day so I’m not too worried, but thanks for your input” and made sure the “put” part was really snappy-like and I turned on my heel to leave. Just then, toothless man said to the woman, “don’t be jealous” and she looked at him all like “did a man with no front teeth just insult me?” and he looked at her like “shut the hell up you crazy bat” and I looked at both of them and was like I bet if I did smack her, the toothless man would probably join in and then he walked in the shop with me and ordered sandwiches and I told him thanks for standing up for me. Because you really never know when a toothless man can and will tell some catty old broad to shut her stupid mouth. But forreal, who says that to someone? “Wait til you see what your tattoo will look like in forty years.” Well, I’m pretty positive anyone with ink either A) doesn’t care what it’ll look like; B) is taking avid care of it to ensure its life and vibrancy; C) may die before it turns gross; D) may have it covered up, touched up, or removed by then; and E) doesn’t care what your stupid opinion of their ink is. As long as I don’t ever look half as heinous as that wicked old witch, I’ll be good. SPF and excellent dermatological genetics help wonders. Also, not being so catty and senile. And fudge helps. Especially of the bubblegum variety. It’s basically a new-age skin remedy making you look and feel like, 40 years younger. So for me, that’s nonexistent years old, but you catch my drift. Or anyway, it’ll take you back to carefree childhood days of smacking on thick, chewy pieces of Double Bubble. 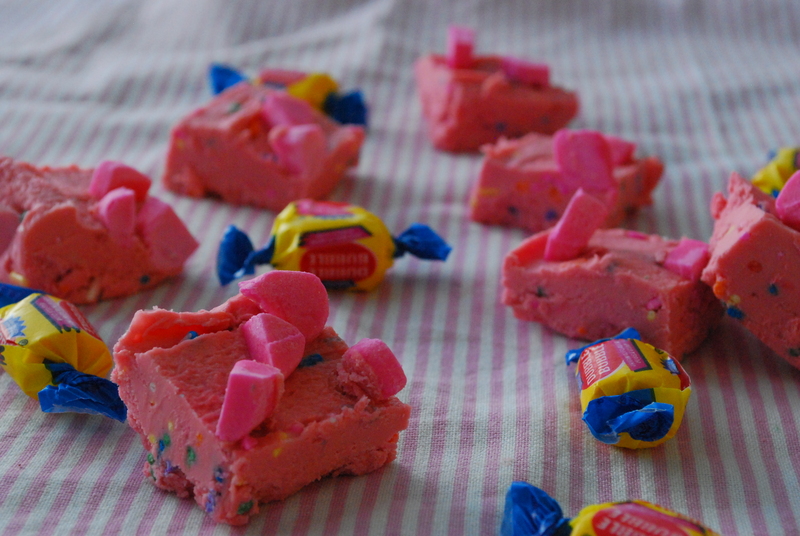 Yup, I combined my love affair of bubblegum with the ease and simplicity of two-ingredient fudge. Y’all had to know some of this would happen sooner or later. 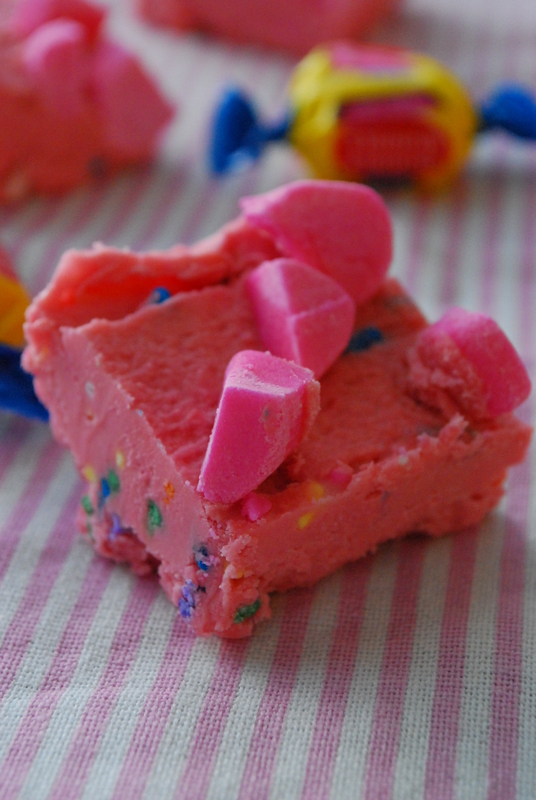 Don’t say I didn’t warn you, because this fudge is psycho sweet and tastes IDENTICAL to bubblegum. I mean, you’ll take one bite and want to chew up all that sweet, luscious bubblegum flavor. It’s intoxicatingly delicious, adorable and OMG… it will do common decency to your mouth-hole, people. And you know how I feel about common decency. 1. Line an 8×8 inch baking pan with foil, extending the sides of the foil over the edges of the pan. Lightly mist the foil with cooking spray and set aside. 2. Meanwhile, in a large microwave-safe bowl, zap the white chocolate chips for one minute. Stir, add a splash of oil if needed, and continue heating for another 30 seconds or until smooth & melted. 3. Immediately stir the bubblegum flavor mix into the chocolate chips, followed by the can of frosting, gently combining. Lastly, fold in the sprinkles. 4. Spread the mixture evenly into the prepared foil-lined pan. Sprinkle the tops with additional sprinkles and chopped gum pieces, if desired. Allow to set for about 2 hours in the fridge, 3+ room temperature, before cutting into squares to serve. 5. Store leftovers airtight at room temperature for about 2-3 days. Um… I have no words. Just a mouth full of insane bubblegum goodness. And uh, you should get in on some of this goodness too. To my dying day I will never understand why people think they have the right to judge other peoples lives, tastes & morals. Live and let live people! And on a funnier note, my sister in law always said she wanted to get a rose tattoo’ed at the top of her right breast…..so that 40 years later it would become and long stem rose! Ahahahahahah that’s funny! I’ve never heard that one before but it’s hilarious! Love it. I don’t understand people either. I was working on remodeling my house and needed to run to the grocery store for sandwich fixings. I left on tee shirt, holey jeans and wore a jeans jacket. I over 60. This woman walked up to me and said “You are totally dressed inappropriately for a woman your age”. I responded in a very non grandmother fashion. Duuuude. I said it before and I’ll say it again: People are the WORST! I will never understand why people think it’s ok to be so mean/rude/judgy. And what an unexpected treat the toothless man turned out to be. Holy cow, I would smack her across the face! To me, people (read customers at Wal-Mart, where I work) often ask, “How many kids do you have?” I’m of South Asian descent, wear a scarf on my head, and therefore, people assume I’m a housewife with kids! What I don’t get is that I have never mentioned that a) I’m married or b) that I HAVE kids, so why ask me HOW many kids I have?! It’s just so frustrating, and I usually don’t have anything to say in response except smile (while wanting to smack them and their evil/screaming children) and bag their groceries VERY QUICKLY so they can get out of my face. Sigh. Why must people be so obnoxious? Some people have no tack….or is it tact? On a side note, I love bubblegum flavored anything. I’ve still yet to try those frosting creations! Slackin’. Sadly, I have no tack. Ugh, it’s REALLY annoying. I mean, I make all these treats and people STILL have to point out my lack of tack. Surrrriously, what did I do to deserve this?! And giiiirl you need to try those flavor packets and STAT. They rock the casbah, obvi. This is a very pretty fudge! I have a tattoo that I got about 20 years ago when I was at Sturgis. Very few people have seen it but often, people will say things about “those people with tattoos” and I’ll let them know that I, prior to becoming HUGELY middle-class, was a wild child and at nearly 50 could give a damn what they think of me! I know you were working and hoping for a tip, but when you get to be my age (I took my daughter to get 2) you really could care less! & EW. Ugh, that guy STILL comes in. Grosssssss. Total rudeness. I’m with Dorothy–spit in her sandwich next time. 😉 But what a nice surprise the toothless man turned out to be–people never cease to amaze me, both the good and the bad. 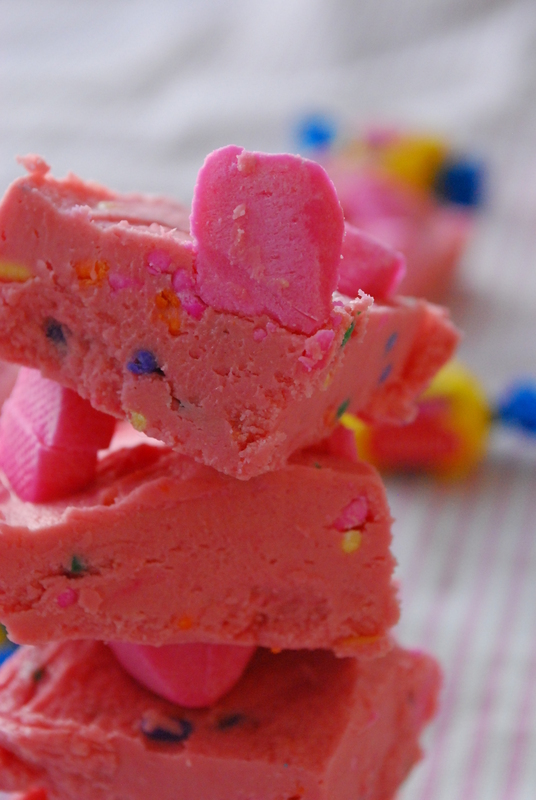 And holy moly, bubblegum fudge?!? Looks awesome! 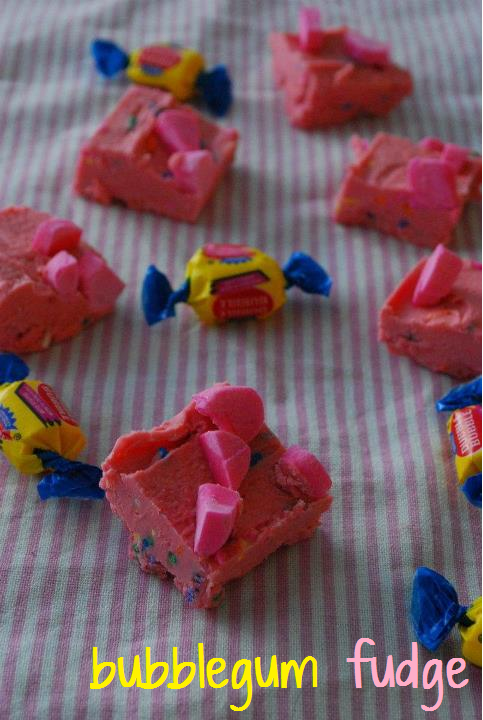 Duncan Hines Bubblegum Frosting Creations mix – I have never heard of it – where can you buy it? I live in Northern Ontario, Canada. 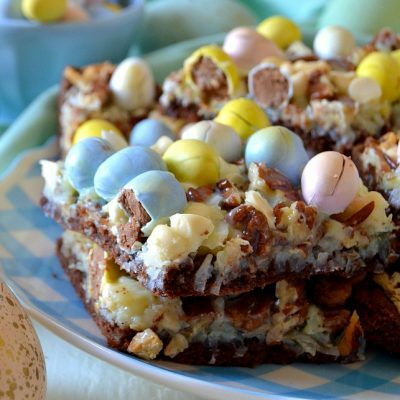 I love your recipes – they are very creative! Hey Bernie, the Frosting Creations mix is a new product from Duncan Hines. Think of it like Kool-Aid, but for canned frosting. You stir the flavor packet into the frosting to change the flavors up 🙂 it’s awesome! Unfortunately, I don’t know if they’re available in Canada yet, but perhaps you could try Target stores if you have those, or your local grocery stores. I’m predicting they’ll be all around soon! Thanks, Bernie! ooh I have seen the 2 ingredient fudge before but I NEVER thought of usign the frosting flavoring in it… my mind is wheeling now! Aurora, people never cease to say the stupidest stuff! I loathe when they unnecessarily put in their two cents about dumb stuff that doesn’t matter. Especially in regards to your weight! Shouldn’t a woman know never to ask another woman about her weight?! Sheeeeesh! So is that 2 hours in the fridge AND 3+ hours room temp? And how did you get yours so bright? Mine looks like bubble gum, but yours looks like neon bubble gum. Hey Emi, no, it’s either 2 hours in the fridge to set OR three hours room temperature to set 🙂 and I’m not sure why mine looks more neon than yours; I didn’t add any food coloring to the batch, but if you’d like you can certainly try adding some pink coloring to the white chocolate chip mixture. Sparkles and neonness make EVERYTHING better, just sayin’ 🙂 hope you like it, Emi! Six Flags Over Texas in Arlington used to make Bubble Gum Fudge when I was an employee there back about ..mummblle ..mummblle… years ago. It had the exact same taste as the Duncan Hines frosting creastions packet, but they stirred marshmallows into it before they spread it in the pan so that when you bit into it, you had the wonderful squishy texture of the marshmallows and the flavor of bubble gum all rolled up in one wonderful awesome treat! Oh to find their recipe…in the mean time I’ll try yours since it sounds wonderful! My kids loved it .I love the cool colours that you have used. Hi Diane! 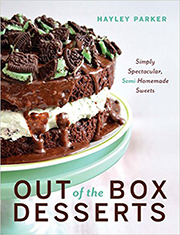 I know, I am so bummed about the discontinuation of the Frosting Creations. BUT, I have news! At craft stores (and on Amazon) you can buy Lor-Ann Oils in bubblegum flavor! They come in tiny bottles called drams. You’ll want to use maybe 1/2 of a dram, up to one dram, depending on how strong you want! 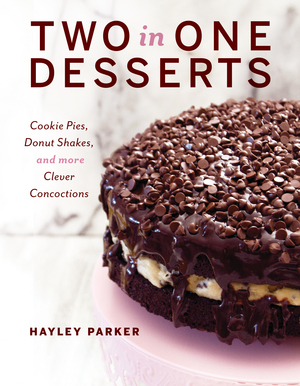 Follow the recipe as is and replace the Frosting Creations with pink food coloring and the oil and you’re set! Hi Linda, yes, unfortunately the frosting creations were discontinued. You can use bubblegum extract, usually found online! Thank you. I didn’t see the reply and wrote another comment. sorry.